This is an extremely novel beauty that we just couldn't resist! Every petal on every flower is a varying masterpiece of amazing purple, lavender & white stripes, streaks, flecks, dots & dashes. Plus there’s a powerful perfume of citrus blossom & rose. The 3 inch lavender double blooms (with over 35 petals) make it a must for a cut flower display, and is a perfect complement among white roses such as White Licorice. 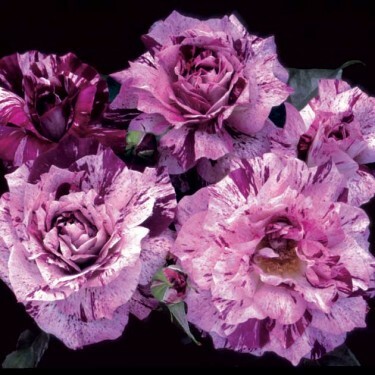 You'll get the best flower size & purple colour in cooler conditions. Our assortment of Weeks roses come in a variety of sizes and have been specially selected for their cold weather tolerance and are imported directly from the Weeks Roses in California, U.S.A.- one of the largest commercial rose growers in the United States since 1938.